I haven’t had much time for MOOCs recently, but when I find an interesting one, I try to fit it into my schedule. Thankfully, this task gets easier all the time. While about a year ago one could pick among a plethora of free courses from Udactiy, Coursera, and EdX, nowadays the landscape is a lot less interesting. Udacity discontinued free certificates some months ago, and switched to a subscription-based model. Coursera has been phasing out their free certificates, “because employers and others found the two different kinds of credentials confusing”, as was stated in the course forum for Advertising and Society. Further, they’ve divided courses into much smaller units. What used to be one large course may now be delivered as four or five separate courses, for which you’d have to pay individually. EdX flirted with the idea of discontinuing their free ‘honours’ certificates, and silently dropped them some time ago. However, they were (silently) reintroduced some months later. Coursera used to be my favourite MOOC provider, but I can’t stand what they have become. The absolutely worst aspect is that they constantly shove advertising for their “verified certificate” in your face. 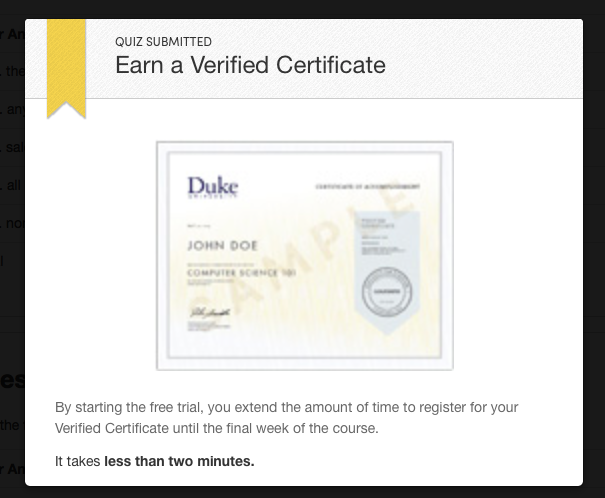 It used to be the case that if you got a decent result on a quiz, they served an ad for the verified certificate. Those ads you could close. Currently, though, Coursera displays ad you cannot close. After you’ve taken the quiz, the screen is overlaid with an ad for a verified statement of accomplishment. Let’s review the answers to that quiz! Sorry, but you’ve got to pay if you want to review your answers. This is utterly inexcusable. I’d expect behaviour like that from a website selling some kind of scam product, but not on a website that purports to be a reputable business. Well, profit-driven higher-education arguably qualifies as a scam, so this move by Coursera may be fitting. Fortunately I live in a country where I have access to high-quality higher education for free, so paying for an automatically generated PDF is simply out of the question. To me, those certificates are a neat motivation to finish a course, but they are essentially worthless. Without the certificates, I see no advantage of a Coursera MOOC over MIT OCW, at least in the areas I’m interested in. That Coursera chose to dramatically worsen the user experience for those who refuse to pay for a verified certificate by showing ads you cannot remove seems absurd to me. Coursera’s numbers arguably demonstrate that this move increases revenues in the short term. Sadly, their numbers don’t capture that this incredibly short-sighted move might alienate a significant part of their user base, which they nowadays call “learners”. This entry was posted in Education on November 10, 2014 by Gregor Ulm. Thank you for writing this blog post. I am engineer at Coursera working on Verified Certificates. We did not mean to block everybody from looking at their classes. Unfortunately, you just ran into an unfortunate bug. I have fixed the code, and should be working again properly by tomorrow. I am very sorry for all the problems this might have caused you. I just wanted to rensure you that we care deeply about students and “learners”, and we want to keep providing universal access to the world’s best education. At least that’s an attempt at damage control. Funnily enough, Michele describes his job at Coursera with the words, “Exploring ways to make Coursera profitable.” We’ve now seen one exploration that didn’t work out so well. Working in technology must be nice because then you can A/B test, and if some questions your business practices, you call it a “bug”. Before the Internet was widespread, companies who wanted to screw you over but were caught red-handed, often resorted to the excuse that they had become the victim of a “technical problem” or a “computer error”. Someone has to make those errors, though. Frankly, I think it’s dishonest of programmers in general to speak of “bugs”. No, dude, you made a mistake! It’s not as if your code attracted some vermin because you didn’t put it in the fridge or whatever. Further, code is, presumably, thoroughly tested before it’s put in production, which means that the way testing works at Coursera is broken, or (inclusive or!) that this little A/B test this blog post exposed happened with the knowledge of others at Coursera. My perception of Coursera has sunken a lot, too. First Udacity, now Coursera. I hope that edX keeps offering free certificates, since they are nice to have. I thought those free certificates were “worthless”, so why do you stop offering them? I wish they were at least honest and said it’s to make more money, instead of those BS explanations like “businesses found them confusing”. If there is one thing I detest in businesses then it’s arrogant PR. Do you guys think your users are idiots who can’t put two and two together? I am really annoyed at coursera too, however bugs in code do happen… If you have tried to write any, sometimes it can be caused by failing to put a space or a comma or a bracket in a few thousand lines of code… They are not easy to spot and unfortunately bugs account for a large amount of lost profit etc. each year for companies and also for data leaks. While this may have been engineered (with how dodgy coursera is I would not doubt it), bugs still do happen (named because of the legend that the first computer ‘bug’ was because an actual bug was caught inside the computer (they were much larger then)). I agree with Jack all the way. I have just enlisted with Coursera for a few courses. I had been told that they had so much to offer, for free. I was skeptical – i knew they’d be a catch somewhere, and it’s always about money of course. I had stalled for a bit because i wasn’t sure but now, i’ve just started learning Human Physiology. I drop out of my biology class in college. I had always wanted to be a doctor, but after that i got into chemical engineering. Anyway, I really like the way the first two lessons are presented – they are interactive and concise. But after finishing the second lesson on Homeostasis the adverts started, it’s always the same one and it won’t go away. They ask me to get a certificate for $49. I thought the whole experience was supposed to be free. Why tell people you’re offering them education for free, then pester them with annoying ads for a certificate. Like Jack said, at least be honest from the get-go and tell people that you’re doing it purely for business reasons i.e. to generate money. I can respect a business that doesn’t try to hide its motives. It’s not a bug, and we are not stupid. Anyways, I’m annoyed and i’ll probably close my account in a bit. I hate being treated like an idiot. But maybe i was being an idiot when i thought i could truly learn online for free. Coursera has gotten a lot worse since I wrote that article. It is now about as bad as Udacity, in terms of how thinly they disguise their ambition for purely monetarily success. Thankfully, edX has been growing tremendously. Not only do they offer the best user experience, the courses are also of a high quality. They only hassle you twice about paying for a certificate, once when you sign up for a course, and then some time later via email, telling you of the great opportunity to upgrade your certificate to a verified one. Coursera does not treat their paying customers any better. I have just completed one of their MOOCs with a Verified Certificate and after spending over an hour on the final exam (which I did quite well on) I was suddenly informed that a) I had to re-verify my identity for that test and b) that it was not supported on the platform I used for the test. Therefore, the results were thrown away. After several go-arounds with support, quoting their own documents back at them, I get the equivalent of “Tough luck, the rules are the rules (even if we won’t actually tell you what the rules are in advance)”. Not only do I need to retake the exam to get what I paid for, but they never once admitted any responsibility for the problem nor did they offer any solution or compensation for the “bug”. I took the class as a test case for my organization. As volunteer emergency responders, we are always looking for good sources of training which can be fit into busy schedules and we also look for platforms to offer the instruction we develop. Coursera is NOT worth the hassle and there are plenty of other sources out there for the money: at least if I spend a day in class, I know I will get something out of it at the end. I used to only use coursera when it first started up a I liked the platform better, however since I started up doing moocs again I have been using edx (the platform is much better and I cannot stand the adds on coursera – it reminds me of another australian uni platform thing which has adds scattered through the badly organised units – can’t remember the name though but it was all 100% free. I don’t see why they can’t offer useless bits of paper i.e. their ‘honour code certificates’. It makes no difference to them and costs them nothing but gives the learner much more motivation to complete the course! I have enrolled in some of the specializations and actually paid money for it, but the fact that I decided to google “coursera gone worse” and hear what other people are thinking about it means things are not moving to the right direction, IMHO. Long ago when coursera was not so popular I was very excited about the course material quality and the fact that it was free I spent most of the time learning new things. But things has changed and not only user interface became less friendly but also the quality of the courses. It used to be high level material but now its just commercial videos and you can watch them in the background and complete exercises without much effort so not much to learn. I think they do this because to attract less skilled people (larger audience) to watch some nice powerpoint presentation pay money get certificate and show to their boss. Well, sad to see but courera became another heavily money oriented website with much lower content quality and user experience. I still enjoy Coursera courses although they have certainly become both easier and shorter, on average, than was the case 3 years ago. Some of the ‘Specializations’ are little more than the length of a single course in the first year or two. I’ve looked at a couple which required 4 courses, each lasting 3-4 weeks and requiring 2-4 hours per week. By contrast, some of the courses I took in 2013 lasted 12 weeks or more and required 8-10 hours per week. Without access to assessment and without any certification (even if they were–and still are–unaccredited) it is difficult to see that Coursera will hold on to the ‘hobby’ learner. While I might begin a course on the basis of general interest in a subject, keeping going will become much more problematic. Of course, it may be the Coursera has no interest in keeping hold of these non-paying students, especially as they have a higher drop out rate. Now that enrolment numbers are no longer seen as the key performance indicator for MOOCs, perhaps they prefer to promote completion rates instead.